Excellent chafe and abrasion resistance. Good fuel and heat resistance. Will fit any thickness of bulkhead material. Will reduce the use of bulkhead fittings. Other seals and grommets may have been adapted from plumbing or electrical applications and do not function well or look right in detailed engine bays. 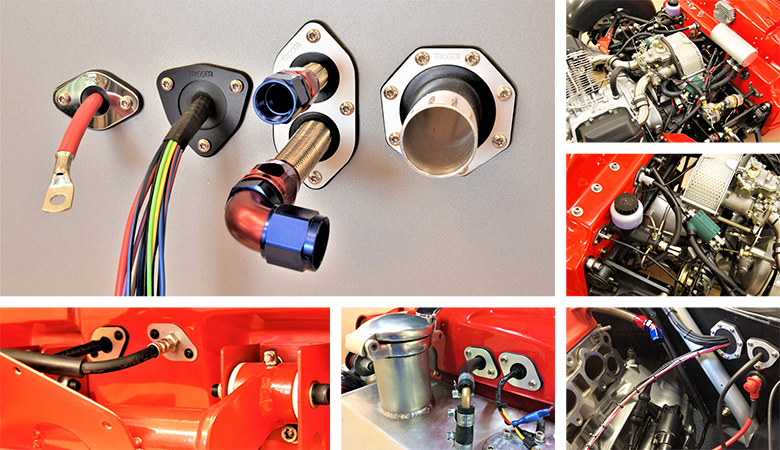 For hand-built cars and classic restorations,Trigger grommets provide a safe and elegant solution to all through-the-firewall installations. A Trigger firewall grommet comes in two parts, plus fixings. The first is a very substantial, 5mm thick nitrile rubber gasket, (70 shore). This is held in place by a compression ring or bezel, made from 316 polished stainless-steel or 6082 aluminium, anodised in black or silver.